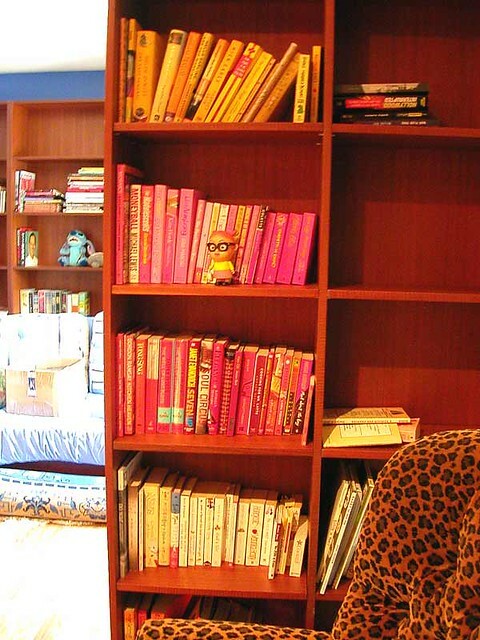 pink bookshelves | Flickr - Photo Sharing! bought in a moment of madonna-in-her-gaultier-days-boudoir madness. damn comfy, and a lot more stylish than this photo would make it seem. george pelecanos, great pulp fiction novelist. check out king suckerman. haven't unrolled the rug yet. last night a dj saved my life--history of british dance music, one dj at a time. moneyball:the art of winning an unfair game by michael lewis. an examination of the 2002 mlb season of the oakland a's baseball team. my only sports book. it's such a great book, that i read it a couple of days and i don't even like baseball. i'm attempting to organize my books by colour. ahavah=love, Michael Notmike, and 4 other people added this photo to their favorites. You are going to love me for sharing this with you... or maybe you've already seen it. abbyladybug--i *do* love you for sharing that, it's so amazing, i wish i'd seen it for myself! i don't have enough books to get that effect, but i think i can get a couple bookcases full to get close. i was going to add to the caption that i don't know where anything is, but in truth, i do remember where everything is. nd we'd love to have your photo added to the group.